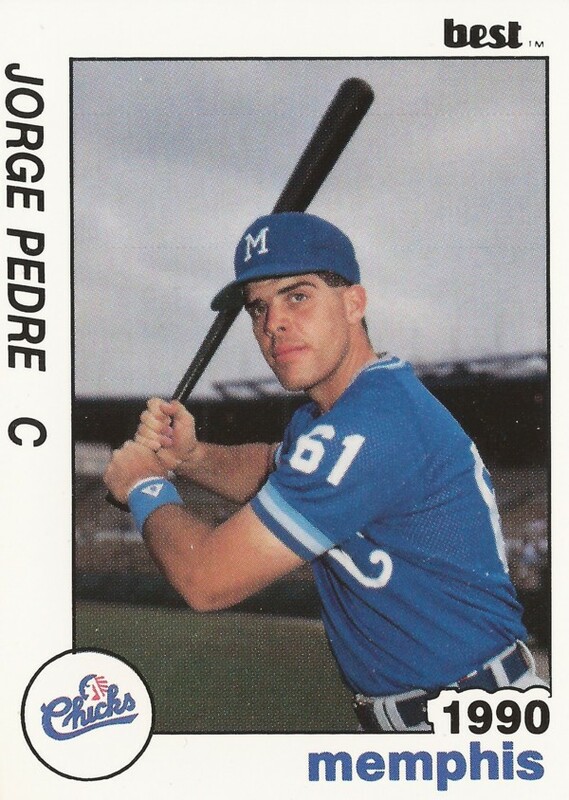 Jorge Pedre looked around in 1991 and saw others get a chance to move up. He was just waiting for his chance, he told The Los Angeles Times. He'd just gotten his chance to move up to AAA Omaha, but he wanted to take that last step, to the majors. "I've been pretty consistent at the plate," Pedre told The Times that August. "I also had a chance to prove at Memphis that I could catch on a full-time basis. Now I'm waiting for a break. Hopefully it will be this year." Pedre did get that break, called up to Kansas City in September. But he couldn't stick. He got into 10 games that year with the Royals and four more the next year with the Cubs, marking the extent of his major league career. Pedre's pro career began in 1987, taken by the Royals in the 33rd round of the draft, out of West Los Angeles College and Los Angeles Harbor College. Pedre started with the Royals at short-season Eugene, the catcher getting into 64 games, hitting .270. He also hit 13 home runs, one in a mid-August game against Everett. "It was a slider or a curve, I'm not sure," Pedre told The Eugene Register-Guard after that August two-run shot. "Whatever it was, it hung up there." Pedre moved to single-A Appleton for 1988, hitting .272. In 1989, he moved to single-A Baseball City, hitting .327 in 55 games there. By early June, Pedre was hitting .351, which represented a drop from where he had been hitting. His manager Luis Silverio told The Orlando Sentinel he saw big things for Pedre. Pedre moved up to AA Memphis later that year, returning to Memphis for 1990. In 1990, he hit .258 in 99 games. Then, in 1991, he made the move to AAA Omaha. In September, he was in Kansas City. With the Royals, Pedre got five hits in 19 at bats, picking up three RBIs and three walks. For 1992, Pedre moved to the Cubs system, taken by the team off waivers. He played the year at AAA Iowa, returning to the majors for four late-season games. He got four at bats and no hits, ending his big league career. Pedre continued playing in the minors through 1994, moving to the Red Sox system that final year, but he never returned to the bigs.